Do you love making vegan gingerbread houses as much as I do? A couple of years ago, we made mini ones that sat on the rim of our cocoa mugs. That was the highlight of my vegan gingerbread house career up until that point. I didn’t think it could ever be topped. Until Jessica asked me if I wanted to make a pastel gingerbread carousel this year!!! 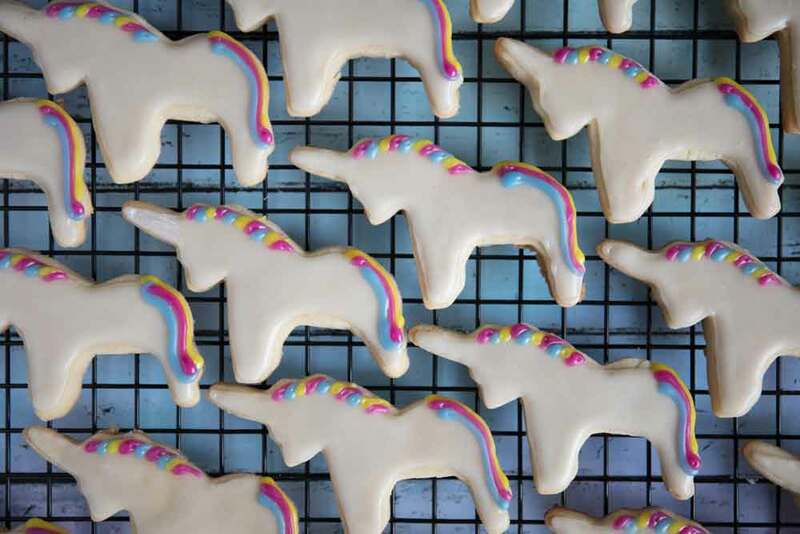 I even practiced my cookie skills a week before carousel weekend with these unicorn cookies. 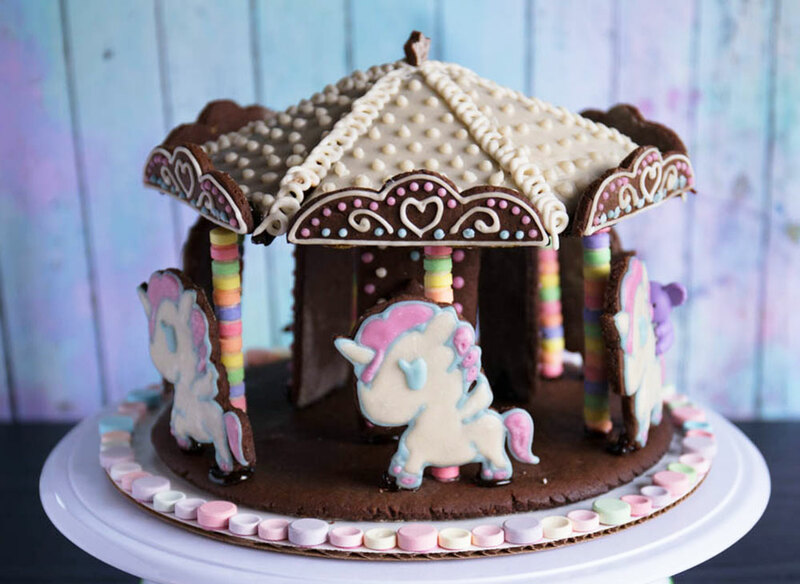 Before I get into the details of how to make one of these vegan gingerbread carousels, I must first give you a few warnings/tidbits of advice. Plan for this activity to take an entire weekend. Cancel all of your plans for the entire weekend (including preparing your own meals, showering, and checking your texts/snapchats). If you have pumpkin pie spice, you can use 2 teaspoons of that instead of the cinnamon, cloves, nutmeg, and ginger. Whisk the ground flaxseed with 1 tablespoon of water in a small bowl. Set aside. Sift together the sugar, flour, baking soda, and spices. Mix the dry ingredients and transfer to a mixing bowl on a stand mixer fitted with the paddle attachment. Add the shortening, molasses, flax egg replacer, and earth balance to the bowl, mixing after the addition. Scrape the sides (and bottom) with a spatula, and remix. Draw your shapes for the carousel gingerbread pieces onto cardstock (or print these onto cardstock). You can use any cookie cutters you have for the carousel animals. Remove dough from fridge after an hour. 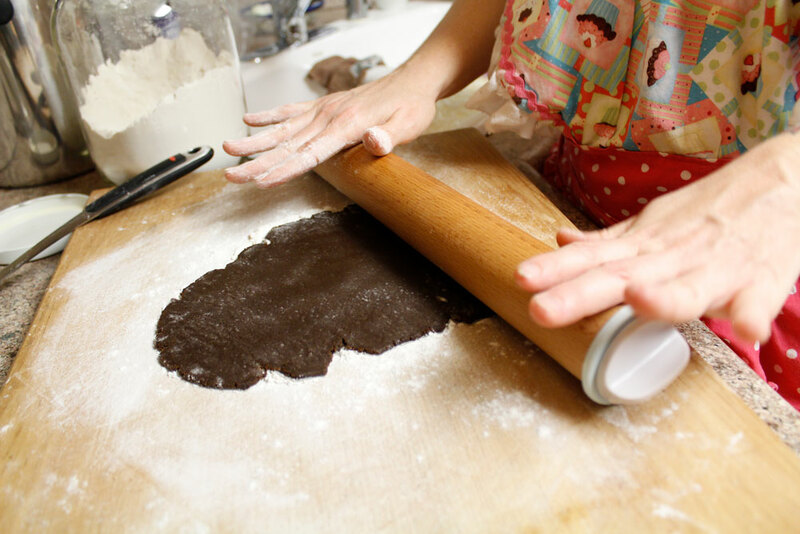 Roll some of the dough on a well-floured surface, with a floured rolling pin to ⅛ - ¼” thickness. I rolled mine to ⅙” because my rolling pin is measure in mm. Chill the extra dough whenever you’re not using it. 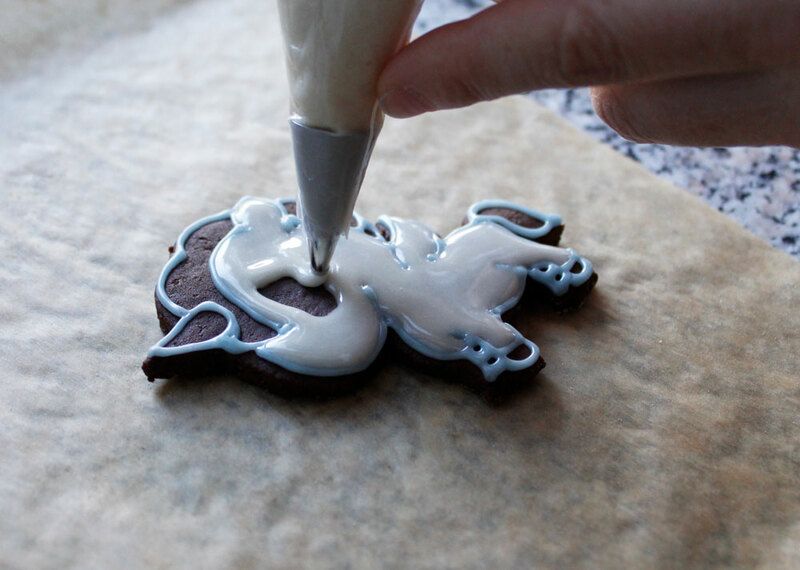 Cut out all the shapes, starting with the biggest, by setting the template cardstock pieces onto the gingerbread and tracing around them with a knife. Place the pieces on the parchment-lined baking sheets. Hint: When you cut out the large circle base, you should go ahead and roll this one directly onto the parchment paper or else it will be difficult to transfer later. Bake each tray of gingerbread pieces for 10 minutes. Remove tray from the oven and let sit until gingerbread pieces have cooled. Repeat until all the pieces have been cut out. 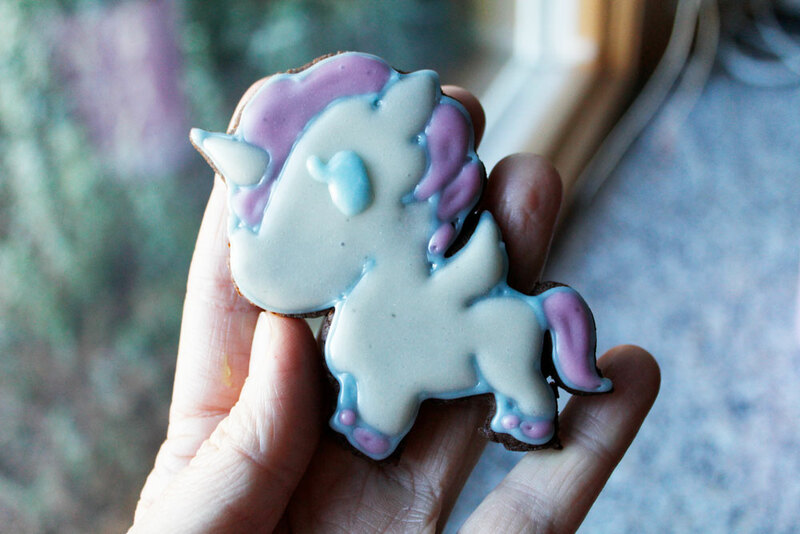 I cut an extra unicorno just in case I didn’t like how the decorating looked on one of them. 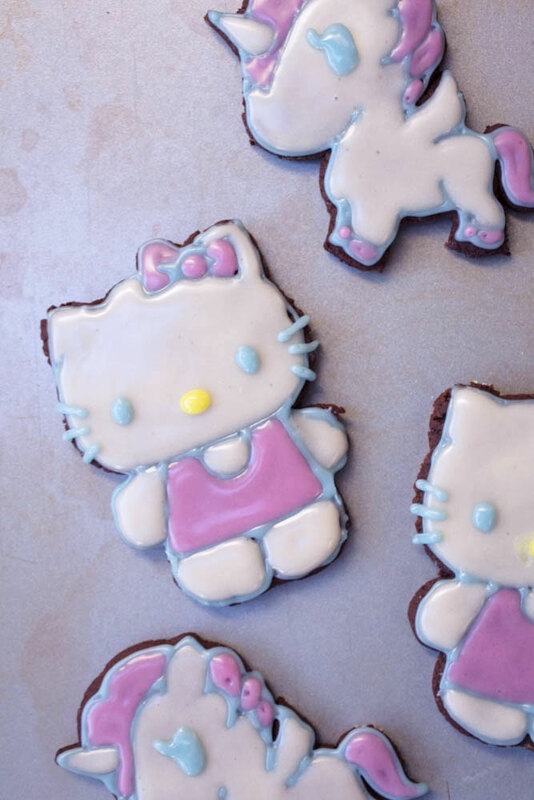 I also had extra leftover which we used to make hello kitty gingerbread cookies. Cool baked gingerbread completely before icing. 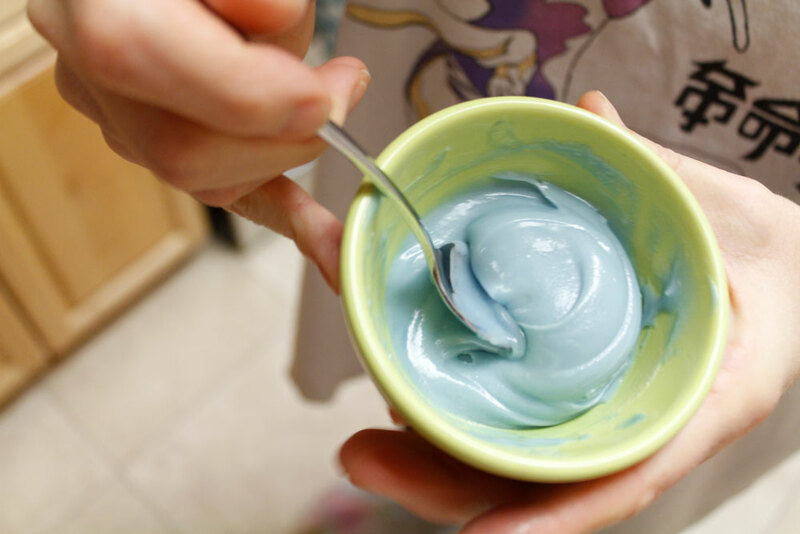 Add a large pinch of blue Color Kitchen food coloring to a small bowl (use a spoon instead of pinching with your hands). Add a drop of corn syrup. Mix well until color is fully incorporated. Add a couple of spoons of the thicker icing and mix well. 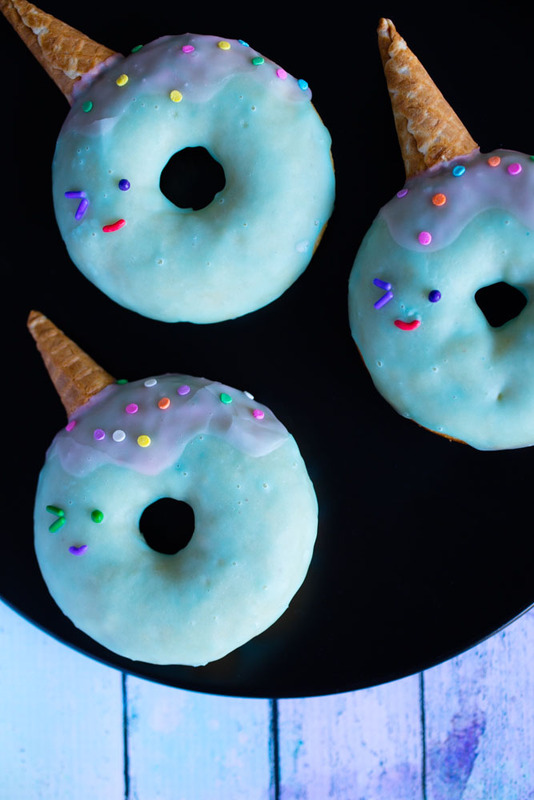 When the color is light enough blue, you can stop adding white icing. Transfer light blue icing to a squeeze bottle with a narrow opening at the top or to a piping bag fitted with round tip #2. Trace the outline of all the carousel animals. Decorate the support beams and/or roof trim with any leftover blue icing. Transfer half of the white icing to a clean bowl and set aside. Add more non-dairy milk (just a tiny bit) to the remaining white icing and mix again. You want a thinner consistency this time to fill in the carousel animals and the roof pieces. Transfer half of the thinner white icing to a squeeze bottle with a wider opening or to a piping bag fitted with a #4 tip. 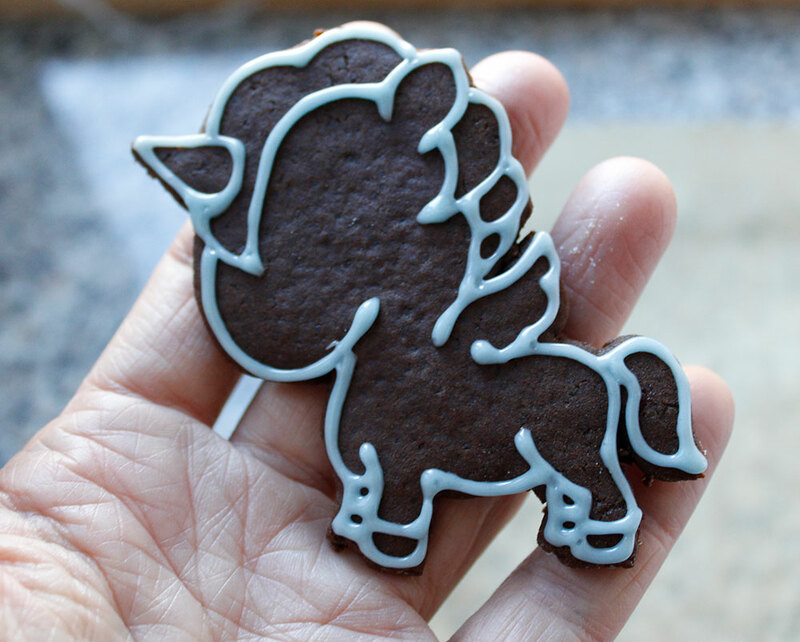 Squeeze the thinner icing onto the cookies that have already been outlined. I use a drawing method, like I’m coloring. Before moving to the next cookie, use a toothpick to help fill in any holes you may have. Continue with the rest of the cookies. Let dry overnight. 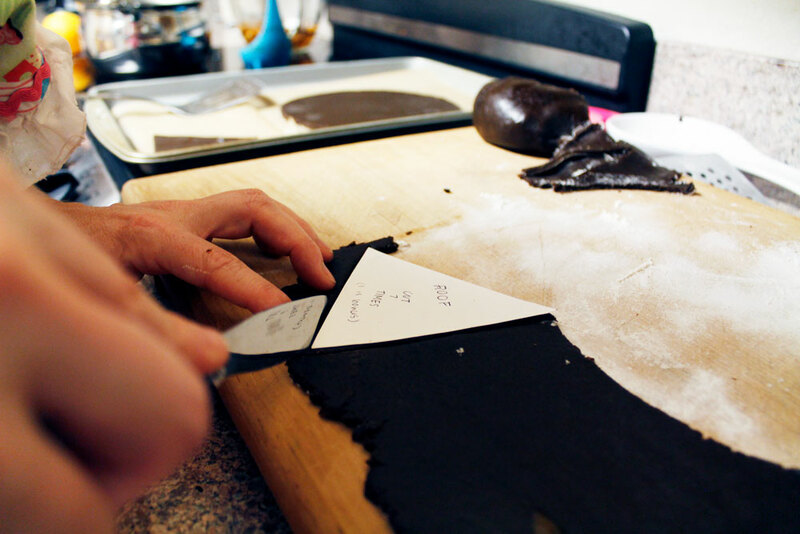 Dip the 6 triangle roof pieces into the icing (only the top side) and set them icing side up onto parchment paper. Transfer the unused white filling icing into the bowl of icing that you dipped the roof pieces into. Cover the thinner icing with plastic wrap and leave at room temperature overnight. Make pink and yellow detail icing using the method described for the blue outline icing. If it’s too thick to mix smoothly, add 1-2 drops of non-dairy milk to the bowl. Draw the details only after the flood (filling) icing is completely dry. Let details dry for 5 hours before handling. In lieu of making the carousel unicorn poles out of candy bracelets / necklaces, you can use red vines or twizzlers as the poles. Glue the candy bracelet candies together using the icing (I used a wooden skewer to make it easier to hold onto them). Make 6 of these using 16 candies on each. Let them dry overnight. They will be delicate so be careful with them. Glue the smarties, bottlecaps, and/or sweet tarts in a circle around the edge of the cardboard circle. If you don’t have these leftover from Halloween, you can alternate vanilla and peppermint mini dandies marshmallows instead. Simmer the sugar in a medium-sized pot over medium heat until it starts to melt into a thick dark syrup. Stir the sugar constantly while it melts. Reduce heat to low so it doesn’t boil over and make a big mess. Glue the gingerbread base to the round cardboard with a small dab of sugar glue to keep it from sliding around. Practice putting the roof pieces together before applying glue to make sure they fit well. If there are any that don’t seem flush, use a cheese grater to straighten out the edges. Hint: applying sugar glue under the roof helps hide the unattractive glue. Glue all of the carousel pieces together using this syrup. I used a butter knife to apply it to the pieces that I couldn’t just dip into the pot. Don’t worry about the candy threads that form because you can break them off later. This candy glue dries really really fast. And once it’s dry, it’s hard as a rock. So, work quickly and precisely. 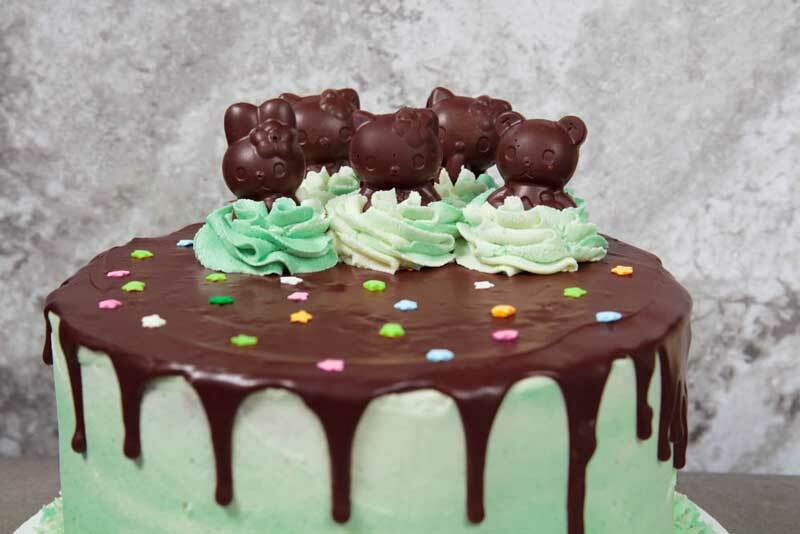 Add finishing touches with icing to cover up any sugar glue that is showing. Use the thicker icing with the #2 tip to pipe on accents (like the dots we added to our roof pieces). If you look closely you might see someone riding the carousel. Warning: The riders of the carousel may not be edible. Unless you eat erasers. If you have a lazy susan or a cake decorating stand, you can spin your carousel too.